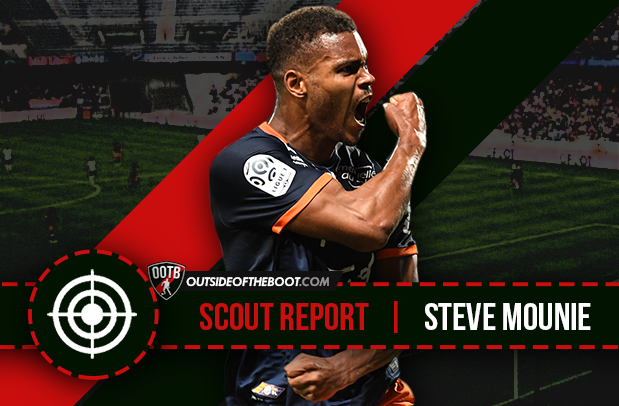 Eric Devin provides a comprehensive scout report about Steve Mounié, Montpellier’s impressive striker. Kylian Mbappé has deservedly been regarded as the best young striker plying his trade in Ligue 1 this season, but that doesn’t mean there aren’t intriguing prospects elsewhere in the division. Bordeaux loanee Enzo Crivelli has scored ten goals in just 23 matches for Bastia, while Gaetan Laborde has scored thirteen across all competitions for Bordeaux. Both of the youngsters represent a newer archetype of striker, a player who has good physical presence but is also good with the ball at his feet and adept defensively as well, working hard to press from the front. The best example of this type of player, though, is undoubtedly Montpellier’s Steve Mounié. The academy product has found the back of the net fourteen times in a mediocre season for La Paillade, taking the step up after a successful loan spell last season at second-tier Nimes. Now linked with Ligue 1’s bigger clubs, or even a move abroad, Mounié’s size makes him hard to ignore on the pitch, but his goal-scoring should be the real reason that he garners attention, evincing himself as a complete striker despite a relative dearth of top-flight experience. Born in Benin, Mounié moved to France at a young age, where he found himself on the books at a variety of clubs in the vicinity of Perpignan, the southern city in which he and his family found themselves. In 2009, he caught the eye of Montpellier, the biggest club in the rugby-crazed region and joined the team as a trainee. Injuries hampered his progress to some extent, particularly in the 2013-14 season, but by the following campaign he made his first team debut, coming on in a Coupe de la Ligue loss to AC Ajaccio. He started last season with the first team, coming off the bench in their first two matches, but jumped at the chance to go on loan at Nimes in Ligue 2. A near neighbor of Montpellier, last season wasn’t shaping up as a promising one for Les Crocodiles, as they were hit with an eight-point penalty for match fixing. The club had initially been set to have an administrative relegation to the National, France’s third tier, so while the penalty did represent something of a reprieve, it would not make for an easy season for a side that had been only mid-table. His good performances for Montpellier’s neighbor saw him return to Frédéric Hantz’s first team, but with much more of a reputation. While eleven goals may not seem like a massive haul, because Ligue 2 is a more defensively oriented division and Mounié didn’t feature for Nimes until Matchday 6, only four players in the league bettered that total. His parent club were duly impressed, and last summer awarded the youngster a contract extension through 2019, a clear statement of their faith in him even as fellow strikers Souleymane Camara and Casimir Ninga had both had decent seasons. This season, Mounié has settled in quite well, even as he has benefited from an injury to Ninga. The two had played together, both in a diamond 4-4-2 and with the pacy Ninga on the wing in a 4-2-3-1, but the Chad international’s cruciate injury left no doubt as to Mounié’s place as the team’s focal point. His fourteen goals and rapport with Ryad Boudebouz have been crucial this season, even if the team have struggled at times, with Jean-Louis Gasset replacing Hantz in January. Relegation has been avoided, even if not by a large margin, and the emergence of Mounié has been arguably the biggest reason for that. Besides his goal-scoring prowess, Mounié has also been integral to the improved scoring form of players like Ryad Boudebouz and the winter signings Isaac Mbenza and Paris Saint-Germain loanee Jonathan Ikoné, often sitting with the ball at the edges of the area to link play as they cut inside. Boudebouz in particular has set a career high in goals, enjoying the space that Mounié is so adept at creating. Beyond link-up play, though, Mounié prides himself on his aerial ability, both from open play and at set pieces. Seven of his fifteen goals across all competitions have come from headers, his pace and physicality making him a difficult player to mark when combined with his height. Mounié’s prime strength is obviously his aerial ability, having won a jaw-dropping 8.5 aerial duels per match. This figure not only leads the league but represents a success rate approaching 70%, a percentage generally only reached by centre backs. This makes him a real threat from set pieces, as five of his goals this season have come from dead balls, including against Lyon the past weekend. As previously mentioned, his link-up play can be brilliant, if somewhat inconsistent; after recording five assists with Nimes last season, he has only two this season, but generally displays a good balance between knowing when to shoot or when to play in a teammate. After enduring a stop-start period in his career prior to his time with Nimes, but readily adapting to being first choice this season and last, even in difficult situations vis-a-vis relegation, Mounié’s mental strength is also to be complimented. His holistic approach to his career’s progression meant that he was aware that playing time, even with a team that was unlikely to realize much success, has benefited him well. He is also possessed with good movement and pace for a player of his size, able to pull wide and play in a winger, as well as press from the front when asked. Mounié is only in his second full season of professional football, and hadn’t even been a regular with the reserves owing to injuries, and as such, there are still a few aspects of his play that require a bit of polish. While he is an enthusiastic presence in pressing, his tackling technique can oftentimes be a bit rough. Indeed, while his aerial success rate is impressive, a good deal of the balls he fails to win aren’t down to the industry or ability of his opponents, but because Mounié has fouled them. He has only been booked five times this season, with one red card as well, but because of this, his discipline could be improved, although much of this may be down to adjusting to the pace of Ligue 1. His first touch can often be found wanting as well; as good as Mounié is as a target man, he is also similarly guilty of losing the ball, whether through a misplaced pass or a loose touch. Again, he’s not necessarily a selfish player, but can be guilty of overestimating his passing abilities, making his link-up play somewhat inconsistent, even if it does show a good deal of imagination. He could also use a bit of improvement on his offside awareness and shot accuracy, but again, at such a relatively early point in his career, there are more than enough redemptive qualities in a player who so easily combines physicality and pace.